I was recently invited to one of the most interesting meals I’ve ever enjoyed. Taking a seat in a dining room that has fed our Nation’s key decision makers for nearly a century. From Borden to the Trudeau’s, this dining room is not only historical but, if the walls had ears, I’m certain some key decisions were made over food and drink in this room. My good friend Paul Lefebvre, Member of Parliament for Sudbury, ON, invited me to dine with him. How could I not! Paul and I go way back, having worked together on French cultural projects in my hometown of Sudbury and always discussing our most recent amazing meals. I wanted to share this dining experience with my readers as one must be invited to dine in the Parliamentary Dining Room. The Parliament of Canada was originally built in 1866 but began rebuilding after a massive fire destroyed everything but the Parliamentary Library in 1916. The Parliamentary Dining Room is nestled at the end of a hallway and surrounds with many accents of wood and marble. It’s been said that the glass domes in the dining room’s ceiling are known to transport conversations from one side of the room the other. At the helm of the kitchen, Chef Judson W. Simpson. With over 30 years experience, 20 years as Executive Chef of the House of Commons in Ottawa, Judson was also Canada’s first CMC(Certified Master Chef). The menu offers a variety of amazing choices to please any palate and all of the wines offered in the dining room are Canadian. As with most upscale restaurants, the chef features a seasonal three course meal. To start we chose the creamy porcini and chestnut soup with apple whip with green onion. The complex woody flavours of the mushrooms and the nutty flavours of the chestnuts were beautifully highlighted with the apple whip, likely a crème fraîche base with seasonal apples. The meal was off to a great start! For our main course, we opted for the venison tenderloin served with buttered fava beans, cabernet cranberry compote, thyme spätzle and a beautiful game reduction. The venison was cooked to perfection and was very tender. The flavours of sweet compote, herbed spätzle and the reduction brought everything together. To cap off our dinner, a plate of mignardises, perfectly crafted bite-sized desserts. Four micro versions of a French macaron, a lemon meringue pie, a chocolate pecan dessert and a sugar-coated jelly. There is something about fancy flatware and a gold parliamentary crest inlayed into the dinner plate brim that elevated the dining experience to new heights. 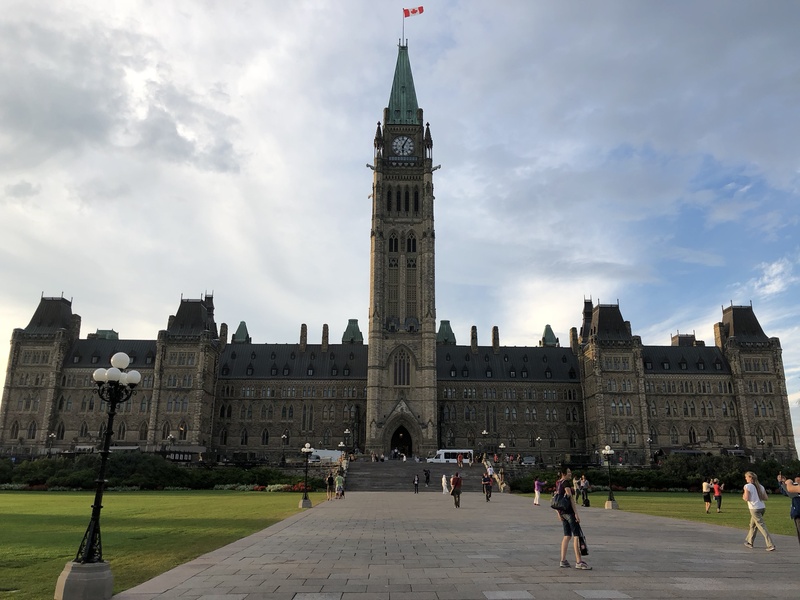 Although many of you won’t have the opportunity to visit the Parliamentary Dining Room, I hope you enjoyed reading this piece and viewing photos from inside.